Unam Sanctam Catholicam: "Not to abolish, but to fulfill"
I'm still not quite clear. "At face value, this would suggest that the Law of Moses was permanently binding in all its rigor. Our Lord makes it explicitly clear that "not one jot or one tittle" shall pass away from the Law, "till all be fulfilled."" I think there needs to be more a distinction regarding exactly what the "Law" is in order to understand both how the Law is obsolete and has passed and yet how not one jot or tittle shall pass away. How specifically, for instance, is the Law fulfilled by Christ when He ate on the Sabbath and yet fulfills the Law which precisely forbade that? And is there anything from the Law that was not merely provisional? Good questions. I will try to amend this article in the next day or two and will let you know when I have done so. Please check back in a few days. What is there not to understand? I have spaghetti, I have minced meat, I make spaghetti bolognese. You cannot chew the hard stems, the uncooked spaghetti is no more, the raw meat is no more, we have spaghetti bolognese. BOLOGNESE! There are also those people who think the Ten Commandments is not part of the New Covenant. I thought that it might help for you to mention that the first few concern God and the last few neighbour. This might help drive home to point that Jesus did not do away with the law but perfected it. The Old Testament is full of types fulfilled in the New Testament. The New Covenant is what the Old was pointing to. Boniface, I'm interested on your thoughts about what Pope Francis said in Evangelii Gaudium No. 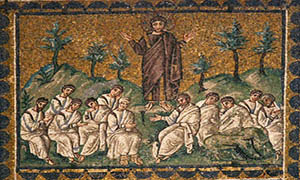 247 which states, “We hold the Jewish people in special regard because their covenant with God has never been revoked.” The solemn dogmatic definition of Pope Eugenius III and the Ecumenical Council of Florence, and the doctrine taught by the supreme magisterium of Pope Benedict XIV in Ex Quo Primum, set forth repeatedly and explicitly citing the definition of Florence that the Mosaic covenant has been “revoked” and “abrogated”. If popes and councils of the passed already established this as doctrine is this statement heretical??? The priest at my local church has stated this publicly several times in public that the Jewish Covenant is still valid. You seem very well educated about this stuff and seeing that your kind of on this subject I'm wondering if you can maybe shed some light on this for me. Fixed. And I tried to give another example. not sure it it will help. This is a tricky problem because, like many other modern statements, it can be taken in two ways. It centers on what people mean by the "Old Covenant". If by Old Covenant they mean the salvific nature of all the rituals, proscriptions of the Old Testament, then of course, that has been revoked, as the Councils and Popes have said. However, if by Old Covenant they mean the Old Testament, in the sense of the revelation of God made to the patriarchs and prophets in the Old Testament of the Bible, then no, this has never been revoked. The Old Testament is divine revelation, inspired by God and binding except in those aspects which were provisional and have passed away with the coming of Christ. The Old Testament is bigger than the Old Covenant. The Old Covenant is merely one part of the Old Testament. The Old Covenant is no longer valid, having been replaced by the New. But the Old Testament as such has never been revoked. The confusion arises between the words "covenant" and "testament", which are often (wrongly) used interchangeably when referring to the New but which should definitely be used distinctly when talking about the Old. The problem is, as in Evangelii Gaudium, we don't know in which sense Francis means this. Regarding healing on the Sabbath, it seems to me the problem lies rather with how we understand "work". Was Jesus doing work in healing? If he did not violate the law but instead fulfills it, we must say no. But we must also maintain the fact that Jesus did not do away with the law, understood rightly, as you note. So the Sabbath is still sacred. Work is still prohibited on it. But the Pharisees did not understand this. Their hypocrisy blinded them to what real righteousness is. Well Jesus quotes the episode of David eating on the Sabbath to justify it. This action was allowed to David because he was in need, and because He was king. So, yes, Jesus shows how He fulfills and embodies the heart of the Law. Boniface, Thank you for your response regarding Evangelii Gaudium. I really wish that Our Holy Father would be more clear as to exactly what he means when he makes a statement. I guess we all do though. I wonder how will this refute the Jews when they claim that the Law of Moses is permanent? And also how will we prove that Jesus is the Messiah when they thought that the Messiah will lead as a political leader? But how do we refute the Jews' assertion that the Law of Moses is permanent...interpreted by the rabbis and those in the sanhedrin leading up to the Talmud? And also how do we demonstrate that Jesus is the Messiah when they have a doctrine that the Messiah must be a political leader? Traditional Catholicism may claim to have unbroken tradition...but the Jews will respond that we broke from their tradition....therefore making us heretics in their view. I know this is an old blog post....but these thoughts keep bugging me.